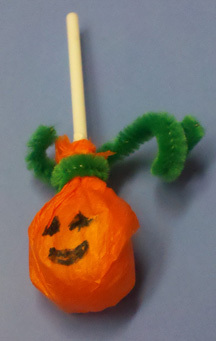 One of the crafty moms in my son’s class helped the kids make these cute lollipop jack-o-lanterns at the Halloween party. The kids enjoyed wrapped up the treat and creating their own “face” on the pretend pumpkin. A group of these would make a great centerpiece. What You Need: Small lollipop (Dum-Dum size); square of orange tissue paper large enough to wrap around the candy; pinking shears or zigzig scissors; length of green pipe cleaner; black marker; pencil. How to Make It: Pre-cut tissue paper with pinking shears for the kids. Wrap tissue paper around centered lollipop. Twist pipe cleaner around base of candy to secure tissue. Wrap ends of pipe cleaner around a pencil for curled vine effect. Add jack-o-lantern face with marker. This entry was posted on Saturday, October 30th, 2010 at 5:09 pm	and is filed under Halloween crafts. You can follow any responses to this entry through the RSS 2.0 feed. Responses are currently closed, but you can trackback from your own site.